I love adventures and traveling the world. But at the end of the day, I’m a homebody through and through. Don’t forget, you’re invited over on Monday for my fall house tour! I’ll have cookies and put the coffee on! Ya’ll. Can you believe it? It’s FOR REAL THE FIRST DAY OF FALL! Hooray! Do you feel a chill in the air yet? 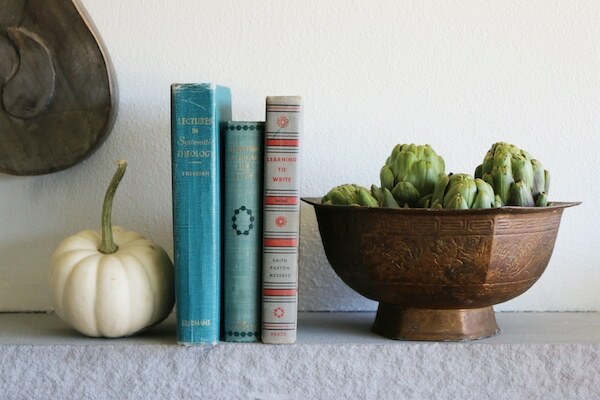 I love everything about fall and I really want to savor it. Do you find yourself more energized to make your house inviting and welcoming this time of year? I do. I’ve actually been on a “cozy up the house” kick for weeks, puttering around and tackling projects around the house like nobody’s business. With a small house it doesn’t take much to get it cozier. I’m loving that! As I said yesterday, next Monday you’ll be invited over for my (almost annual) fall house tour, so stay tuned for that. I was so glad to hear that you are excited for the tour! 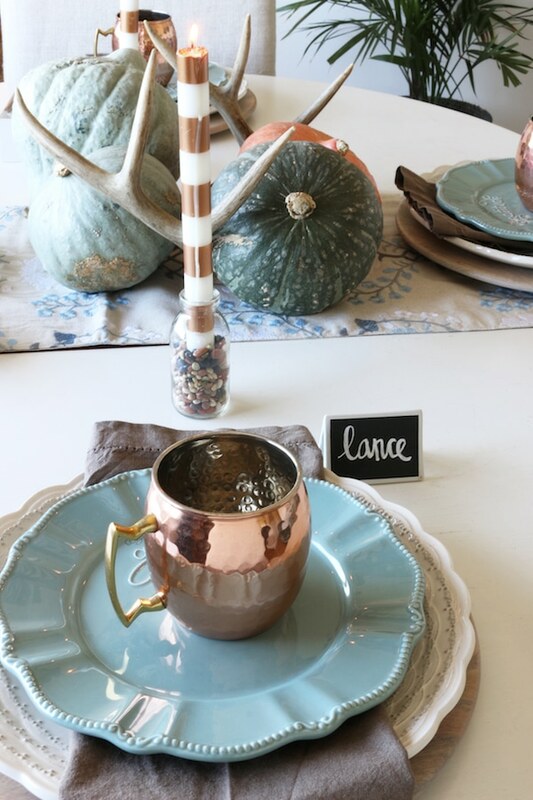 But as dreamy as a “fall house tour” might sound (and is for so many bloggers, I saw some pretty dreamy fall houses this year! ), my reality is our kitchen is about to be gutted and various other projects are still in process (and leaving their mark of chaos everywhere). No perfection here. That imperfection means I’ll be welcoming you into both the cozy and the chaos. :) And, yes, for those of you who have asked, I’ll finally show you our (still incomplete) side yard progress and a peek at our white brick exterior! The effort is all going to be worth it in the end. I keep telling myself it will get done when it gets done, so it doesn’t help to feel stressed out about it. In fact, sometimes with delays or more time to think things over, I’ve found we make adjustments or decisions that will work better for us anyway, either financially or design-wise. It’s all a part of the creative process, but the twists and turns do make life interesting sometimes! One of my favorite secrets of balancing our busy life and still keeping up with all of our projects is to delegate everything I possibly can. As I’ve shared in previous posts, I often order our meal ingredients to be delivered from Blue Apron to help bring more sanity to a crazy week. We seem to always have a lot going on and this fall will be no exception. Soon we won’t have a kitchen and we’ll have to wash our dishes in a bathtub for awhile. It’s going to be an adventure! Many of you have asked what we’ll do without a kitchen over the next couple of months. We are still committed to making as many meals at home as possible during the process, so we’ll set up a makeshift kitchen in our laundry room and rely on our electric skillet, a crockpot and BBQ (weather permitting). 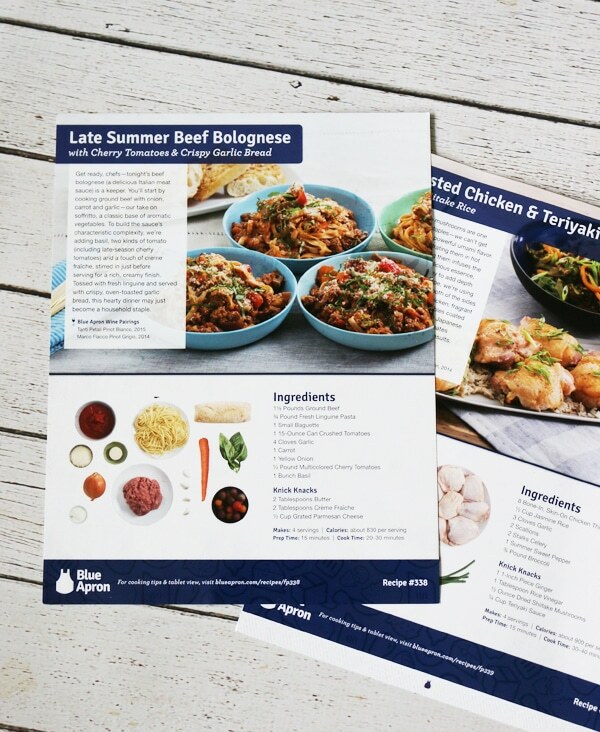 Blue Apron always saves the day for our family because it’s a guarantee we’ll be eating well that night, no matter what kind of day I’ve had or what projects we have going on around the house. I always do a little happy dance because everything arrives farm-fresh in a refrigerated box, ready to prepare. Which basically means I feel like I have a personal shopper to go to the grocery store for me (bless) and even my very own Alice from the Brady Bunch to help me get dinner on the table! Who doesn’t dream about having an Alice? 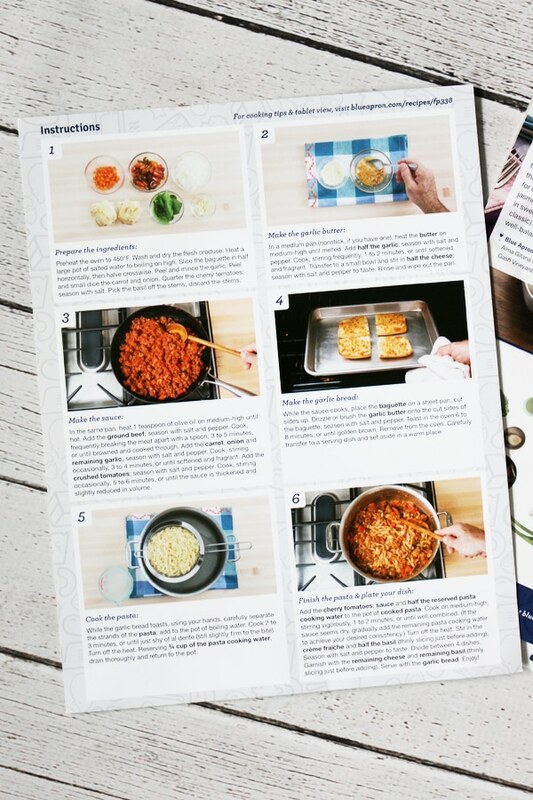 I also love seeing what new recipes are added to Blue Apron’s menu options each week and that the ingredients are sourced from quality suppliers and artisans.. It’s also easy to skip meals or cancel whenever you want, so there’s no pressure or obligation to keep up with a schedule or order meals you don’t need. 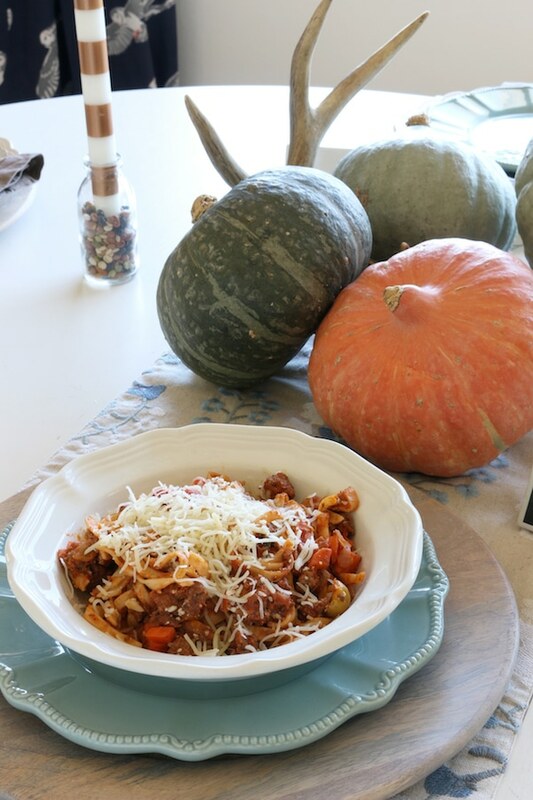 Recently we made Blue Apron’s Beef Bolognese, which felt like a perfect meal to transition us into fall cooking! And fall eating :). 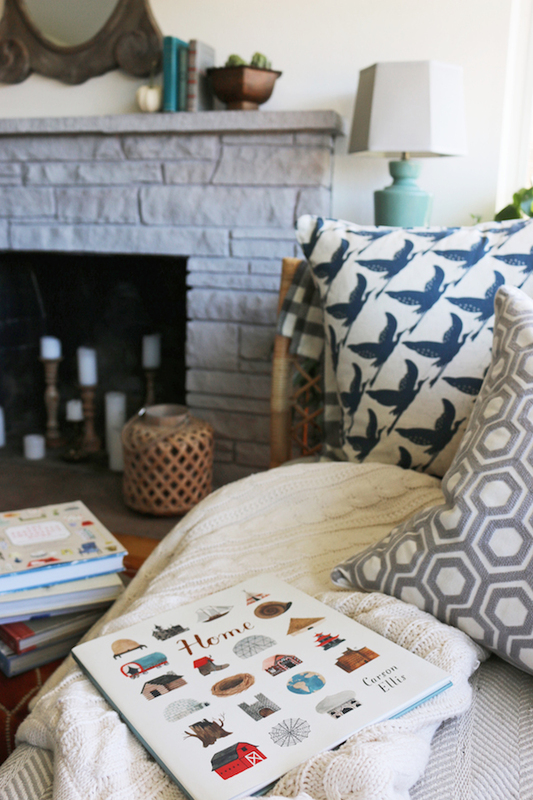 We have been working on cozying up our dining room (which I can’t wait to show you!) so we had fun setting the table all pretty and sitting down to enjoy every single bite of our dinner. 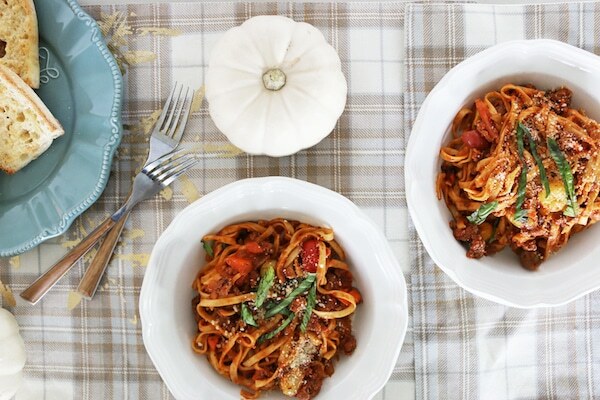 Sitting down for a home-cooked meal helps us to feel more sane, too. So, no matter what chaos or craziness is going on in your house, I hope you can find at least a few ways to slow down and enjoy the season. Put flickering candles in lanterns on the porch. Sip hot apple cider from a giant mug. Wrap up in warm plaid blankets next to the fireplace. 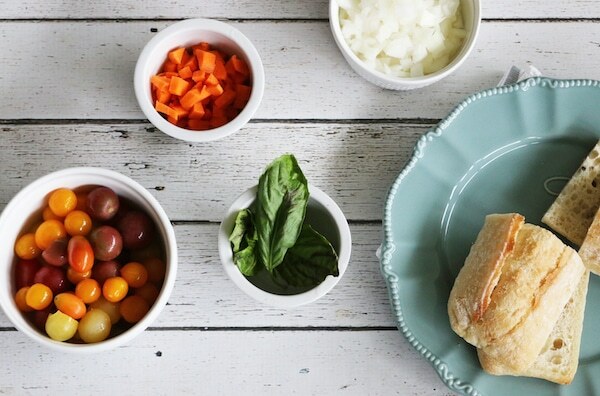 Blue Apron is offering The Inspired Room readers an amazing deal: The first 25 people to sign up will get three free meals on their first Blue Apron order! What are some cozy things you are looking forward to in the coming weeks?